Paul, a trained artist blacksmith with more than 20 years’ experience, is known to the employees of the various scrapyards that he frequents as “Mr Iron Man”. He is one of a dying breed in this ancient craft. He runs the only “green” forge in the country, and possibly the world, on Saartjiesnek, Hartbeespoort. Born and bred in Johannesburg to immigrant German parents, Paul always knew he wanted to work for himself and be creative. “After my military service, I met the archaeologist, Prof Revel Mason of Wits, who specialised in Bantu art and I started dabbling in forging iron. Through him I landed a three-year apprenticeship with blacksmith Guy Luck in Cape Town. I really started from the bottom, hauling coals for the furnace,” he laughs. The apprenticeship also led him to love. “Louise Holm was one of the other apprentices with Guy and we met up again at a wedding a few years after, where she introduced me to her cousin, Wiebke.” Sparks flew and the anvil clunked for both. When Paul returned to South Africa, he opened his forge in Hekpoort, but with the birth of his and Wiebke’s four-year-old twin daughters, the family decided to move to Hartbeespoort. “It was just a bit too isolated in Hekpoort for the girls, but I still keep my large machines there as they are too powerful to be run off solar power.” His father-in-law, Dieter Holm, is a pioneer in the field of solar energy. His house, built 40 years ago, was the first entirely solar-powered house in the country. 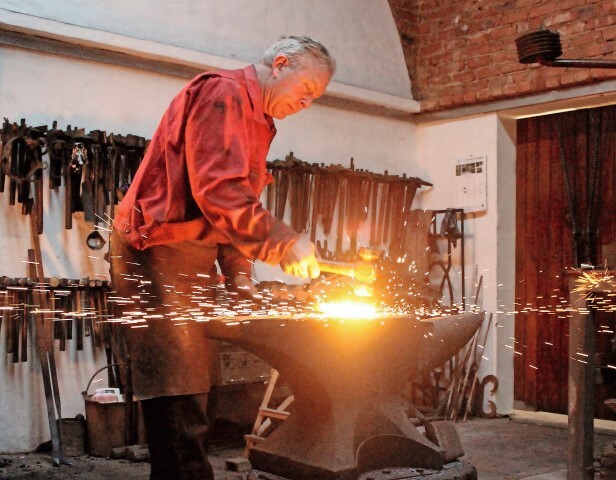 Paul follows classic blacksmithing techniques – punching, splitting, riveting, wrapping and fire welding – for the bespoke staircase rails and balustrades, benches, gates, screens, hat-racks, burglar bars, sculptures, chandeliers, lampstands, grandfather clocks, headboards, fireplaces and other artwork he makes. His work is testimony that functional doesn’t have to mean ugly or industrial. He has a particular interest in old Africana pieces and scours scrapyards, old farmyards and metal dealers for rare finds. Through Louise’s dad and Wiebke’s uncle, Prof Erik Holm, who restores old oxwagons, he is fortunate to receive old axles and other old iron pieces that he transforms into artwork. Otherwise he uses mild steel which he orders from various suppliers. Paul presents workshops from time to time to share some of his expertise, but he is worried that the traditional blacksmithing processes and techniques that have been passed on from master and apprentice through many generations, are going to die with this generation.